The Basement Vapes, Volume Five: From Beatle To Bowie, Bad Boy To Bad Girl—Won’t You Try Some, Buy Some? In many ways the song was a byproduct of Harrison’s relationship with Spector and their work on All Things Must Pass—the sprawling three-album set that was Harrison’s first effort after the Beatles disbanded. Harrison wrote “Try Some, Buy Some” during those epic sessions in 1970, but for some reason he didn’t get around to recording it. Instead, the tune was flagged for Phil’s then-wife Ronnie Spector. Ronnie Spector, with that streetwise, beseeching, bad-girl/baby-doll voice. Ronnie Spector, the sultry star of iconic ’60s girl group the Ronettes, once famous for songs like “Be My Baby.” Ronnie Spector, who had been in reluctant semi-retirement alongside hubby Phil, who’d withdrawn from showbiz following the commercial failure of his lavish production of Ike & Tina Turner’s “River Deep — Mountain High” back in 1966. Ronnie Spector. 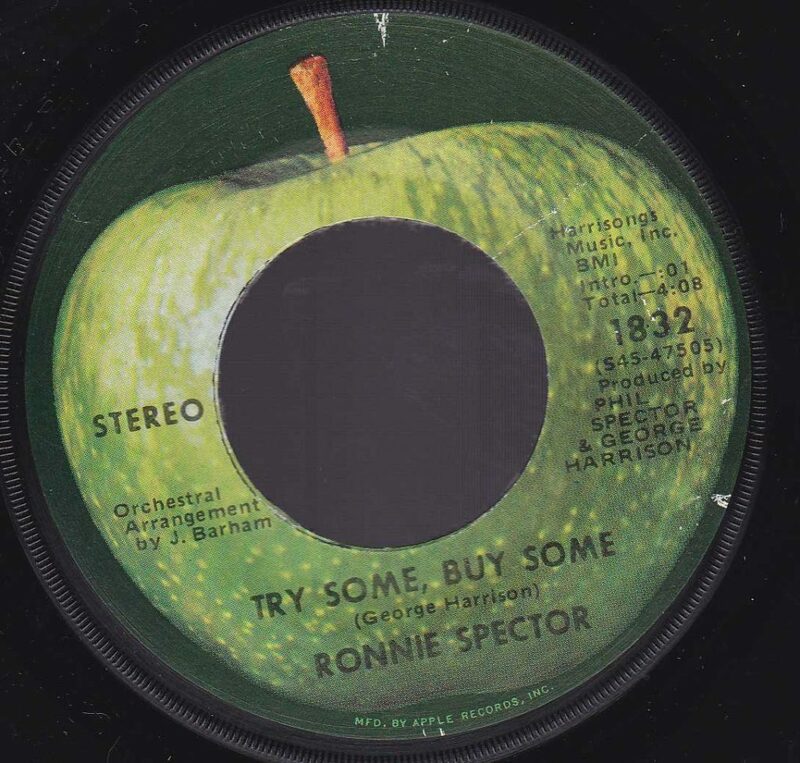 So, it was decreed that “Try Some, Buy Some” would be recorded by the amazing Ronnie Spector as part of a proposed comeback album. Per an agreement between Phil and Harrison, the latter would write some tunes for Ronnie, the former would co-produce the recording sessions with Harrison, and the album would be released on the Beatles’ Apple Records. Harrison and John Lennon were big fans of Ronnie and the Ronettes, and both Beatles were willing to sponsor the collaboration. Ronnie’s performance was recorded at Abbey Road Studios in London and featured several musicians who’d appeared on All Things Must Pass, including Harrison, Wrecking Crew session veteran Leon Russell, Beatles-buddy bassist Klaus Voorman, drummer Jim Gordon, keyboardist Gary Wright and Badfinger guitarist Pete Ham. Things didn’t go as planned, however, and the Apple supergroup only did a few tunes before the comeback project faltered, mostly due to Phil being way too drunk/wasted/erratic to produce an entire album showcasing Ronnie’s talents. Musically, “Try Some, Buy Some” is a waltz with a descending melody that Harrison had composed on keyboard. Harrison usually wrote on guitar and actually needed help from Voorman just to play it on the piano. The song was one of Harrison’s devotional odes, extolling the virtues of his religious experience through an ironic, televangelist-like perspective. Ronnie was out of her element singing this hippie-rock confessional, and she didn’t relate to Harrison’s ponderous lyrics. In some later interviews, she claimed to have disliked the song and really didn’t understand his obtuse testimonial of values. By itself, Ronnie’s noble rendering of “Try Some, Buy Some” would’ve been a fascinating footnote in Beatles history, as well as another sad preamble to Phil’s horrible decline. But Harrison wasn’t quite finished with the song, choosing to include his own version on 1973 album Living In The Material World, his fourth solo LP, following 1968’s Wonderwall Music, 1969’s Electronic Sound and 1970’s All Things Must Pass, as well as 1971 all-star benefit album The Concert For Bangladesh, which he had spearheaded. When assembling his version of “Try Some, Buy Some,” Harrison made the odd decision to place his vocals atop the same instrumental tracks they’d used for Ronnie’s single—including Barham’s orchestral arrangements and Phil’s grand production. Choosing music that had been designed for Ronnie’s voice, Harrison was compelled to sing in a higher key less natural for him, straining his vocal approach. When Living In The Material World came out, it went to the top of the charts and was Billboard’s number-one album for five weeks. But working with Phil had been untenable, and except for “Try Some, Buy Some,” Harrison produced the new LP by himself. As a result, this lone track featuring Phil’s co-production stood out from the rest of the record—feeling a bit disjointed and perhaps tacked on as an afterthought. The performance was a vortex of influences thrust between Harrison’s pleading vocals, Barham’s heady arrangements and Phil’s heavenly production. There was something majestic in this effort, and with Harrison singing the personal lyrics he had written, his vocals contained more authenticity. The song achieves a certain grandeur, and at the peak of its instrumental coda, celestial strings and brass swell and repeat while drummer Gordon rolls and fills in dramatic, Ringo-like fashion. Although Harrison had used the Spector-produced backing track, his record was still mixed differently—more atmospheric and less mandolin-heavy than Ronnie’s version. In a way, this odd confluence of sound and vision was probably Harrison’s last great Beatlesque moment, evoking the sense and sensibility of George Martin’s regal production work with the Fab Four. Nevertheless, “Try Some, Buy Some” was neglected within Harrison’s catalog of hits and favorites. As far as we can tell, there were no cover versions of the tune for three decades until David Bowie recorded it for 2003’s Reality. Made two years after Harrison’s passing, Bowie’s version wasn’t created as homage to the recently deceased Beatle. Rather, it was simply because Bowie—like the Beatles—was a huge Ronnie Spector fan and also loved the old Apple single. Bowie had long favored the tune and originally planned to include it as part of the unrealized follow-up to his 1973 collection of covers, Pin-Ups. It’s interesting to note that “Try Some, Buy Some” would be the last cover tune that Bowie would ever put out on record. Otherwise, appreciation for this song has been slow going, but Ronnie finally did come around. In 1999, she claimed to love the tune and said that the single “was done to make me happy, and it did. It might not have been made for the right reasons, but it’s a good record.” Thankfully, Ronnie’s version of “Try Some, Buy Some” became available again on 2010’s Come And Get It: The Best Of Apple Records. Some of Ronnie’s ambivalence toward the song was probably because it just wasn’t a hit record. Perhaps that same fact impelled Harrison to take another crack at it on his own album. For Bowie, a music fan with highly eclectic tastes, the song’s lack of commercial success clearly mattered very little. In any case, we think we’ve got it figured out. Thanks to an inspired appropriation, somebody realized that since the music was the same, you could just combine Ronnie and Harrison’s versions of “Try Some, Buy Some” to create a perfectly smashing duet that never happened. With the two trading verses, singing the chorus together and blurring the line between love and spiritual devotion, the dynamic encounter creates a new whole, one far greater than its composite parts. This was the solution that was staring them right in the face back in 1971. If Phil had just gotten Ronnie and Harrison to perform this divine tune together at the time, the collaboration between one Beatle and two Spectors would’ve garnered plenty of attention. It might’ve made great television, maybe even succeeding in the hallowed pop marketplace that they all seemed to value so much. Well, that’s our pitch anyway. Won’t you try some, buy some? Previous PostPrevious Happy 70th Birthday Tommy Ramone (Ramones); R.I.P.